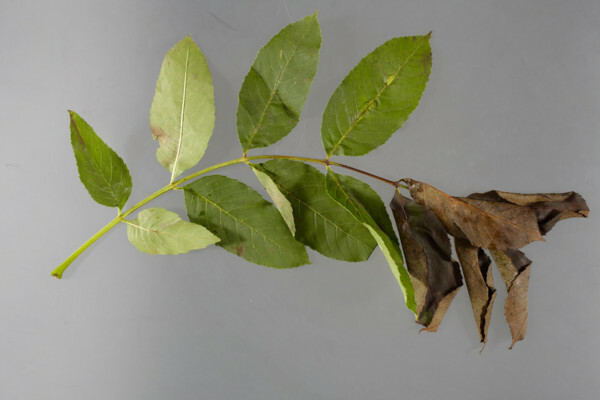 Chris - A major news story in the UK this month has been the discovery of ash dieback disease, a fungal infection that destroys ash trees unfortunately. To find out more about this threat and whether or not we can control it before it spreads further, we're joined by Reading University Plant Pathologist Professor Michael Shaw and Cambridge University's Professor of Mathematical Biology, Chris Gilligan who's also chairing the government's task force looking at this. We'll begin with Michael first. Hello, Michael. Chris - First of all, what is this disease that were calling colloquially 'ash dieback'? Michael - It's a fungus which spreads by spores which form on fallen leaves and can infect leaves of a healthy tree and then spread from there into the bark, and the conductive tissues of the tree, and cause wilting of shoots. Eventually in small trees it will girdle the trunk and kill it. In older trees, it kills shoots and maybe branches, and weakens the tree so that it becomes vulnerable to succumb to things which wouldn't normally be a lethal disease. Chris - Is it just ash trees that are vulnerable to this particular infection or can it hop on to other trees and species too? Michael - As far as we're aware, it affects a group of ash trees. Particularly the common European Ash which is the one we have, a couple of other species. It seems to be less effective, less of a serious problem on far eastern ashes and in fact, the evidence at the moment is that it comes from the far east. It seems to exist in a benign form, co-existing fairly happily with certain types of ash tree in Japan and presumably the wider far east. Chris - How do we think that something from the far east took up residence in Britain? Michael - It's taken up residency in Britain because some time in the early 1990s, it took up residence somewhere in eastern Europe, let's say in Poland and it's been spreading from there as a spreading infection since that time. It was in Scandinavia in the mid 2000s, by 2009, I think, 90% of Danish ash trees had some signs of infection. It's now in France as far as the Massif Central. So, this is a big spreading wave of infection. How it got to Poland, we don't know. Chris - We're hearing this number of 90% of ash trees are vulnerable. Is this a reflection on the fact that not all ash trees are made equally? Are there different subtypes of ash tree? Michael - Well, no. it's more that ash trees are sexually reproducing so they're quite variable. And in studying trees which appear to have been less badly affected in Denmark and in Norway as well, it's been found that some trees appear to have survived because they're genuinely more resistant to the infection. In looking at the progeny of those, looking at the seeds that arise from those trees, there are estimates of maybe 1% of the population will be able to survive. Chris - So, is the long term prospect that will end up selecting out the trees that are vulnerable to this, but will breed a new strain of trees just naturally which are naturally resistant to it. So we just have to wait for one generation of ash trees and then we'll have trees that are not vulnerable so the problem will go away. Michael - Probably more than one generation because you'd have a sort of sputtering epidemic. You'd have some trees which survive the first waves anyway. I think that is probably correct. The only catch there is to think what the generation time of an ash tree is, particularly to get some of the more attractive landscape trees that may be over a century old. So we're talking for the next maybe decade or two, we would see perhaps a third of the landscape and forest trees around us disappearing; ash is extremely common species. Then gradually, there would be a repopulation from resistant individuals. Of course, the disease may evolve at the same time, so we can't be absolutely sure what is going to happen. Chris - And can it be treated if you've got a tree which has got it? Is there any way to save that tree or is these curtains, you've got to chop it down? Michael - Trees don't have an adaptive immune system. So there's no way in which you can immunise a tree against this infection. The kinds of disease management we might use on crop plants which involve chemical fungicides are not feasible or would have side effects worse than the disease itself if you use them in the open environment, because you would have to keep repeating them. So, a parallel kind of disease would be apple scab which is often treated with 5 fungicide treatments in a year. And that would have to go on indefinitely. So, there isn't really any way in which we can cure a tree. For an urban tree, a much loved specimen tree, it may be possible. I'm sure people will be trying injecting fungicide directly into the tree, but it will be expensive and unfeasible in the wider environment. Chris - Intravenous treatment for a tree. Let's bring Chris Gilligan who is chairing the government's task force and he's also a plant scientist at Cambridge University. So Chris, you've been down to advice the government. What did you tell them? Chris G. - I've come into this really as an epidemiologist and a mathematical modeller with some experience of developing models for a range of pathogens that might come in and attack a range of species including guard trees, but also, we've worked on bubonic plague in the past for example and used some similar methodology. Essentially, one wants to think what are the 3 or 4 key questions that we might want to address in thinking about an invading pathogen? The first is, you want to predict the spread. Secondly, you want to identify regions that are most at risk. Then you want to think about the effectiveness of management strategies as Michael has been referring to, and also telling us where to look in order to determine how the pathogen is spreading, and that's where we use mathematics. Chris - What are you finding so far? Chris G. - We're finding that this is a challenging pathogen. It has spread as Michael has said rapidly, well over a period of 10 years right across from Poland, now into the UK. We're working very closely with a range of government scientists to identify where the signs of infection are, whether they're in mature trees or whether they're in sites in which young saplings have been introduced. And that distinction is very important, particularly in thinking about the mechanisms for spread and also the potential for control. Chris - A lot in the newspapers have had things like, they've said, "Now, it's in mature trees. The horse is bolted. There's not a lot we can do." Is that because if it's in mature trees, that's an indicator that it's out there in the wild and spreading, and that all the control strategies of nurseries, you can do all that you like, but you're not going to stop something once it's out there in the wild tree community? Chris G. - Well, these are early days yet and we're simply developing models and testing them. My group is working almost 24 hours a day at present to develop models as fast and importantly, to test the models as rigorously as we can. Chris - What about the distribution of ash trees around the country though? Do you make assumptions about where all the ash trees are and are they fairly homogeneously scattered across the country or are there hotspots, pockets if you like of where there are lots of ash trees, and then not very many? Chris G. - This is one of the big challenges in dealing with an invading pathogen particularly of plants because although people might immediately think we know where all the ash trees are, in fact, we don't. We know where a lot of them are and a lot of effort has been taken up over the last week, in links with the Forestry Commission to determine what are the best data that we possibly can get in order to obtain a map of where the ash trees are, and particularly the connectivity and breaks in the distribution of the ash trees. We now have, I think the best possible map that could be got in time. Chris - When foot and mouth came to Britain about 11 years ago, that was controlled by removing all of the animals in infected areas, just literally blitzing them. It's almost creating a sort of fire break and then sterilising an area. Will that strategy not work here? Could we not home in on areas where there are active infections in trees and remove all of the trees, and therefore, remove the source of infection? Chris G. - This is exactly why, as a mathematical modeller, I would say we need to have the mathematical models in order to be able to do the 'what if' scenarios to compare different types of control. We have very recently over the last few years in fact, been looking at the spread of another disease of trees called 'sudden oak death' in the United States where it's devastating larger areas of California and the equivalent pathogen is ramorum disease of Larch in this country. And we have used the model to identify a culling strategy that is likely to have some effect in reducing the spread of disease. To reduce all of the disease, to eradicate it in fact, would be extremely difficult and extremely expensive. Chris - So, let's just ask Michael to wrap this up for us. Michael, what do you think the sort of long term prospects are? Are we going to face a Britain with no ash trees because they make up what 40% of our natural woodland stock, don't they? Michael - I don't think it's quite 40%. No, but it's a very large proportion. It will make a very big hole in the landscape and I am pessimistic. I hope Chris's group will do the sums, but a windblown disease is a very difficult thing to control. And so, I am pessimistic that over the next decade or two, we'll see a lot of tree deaths. As I say, in our children's lifetimes hopefully, we will see some recovery to a more stable position, but it's not looking good. Can genes save our trees?